We've got an hour here before our flight leaves for New York. We were hoping our flight would be delayed and we'd just have to stay until tomorrow. If it had been, we would go to the Blue Lagoon spa about ten minutes from the airport. Hot water mineral pools that are bright blue in color. Busses go regularly between the airport and spa. They even have a service to hold your luggage while you bathe, and you can rent bathing suits and towels there. Alas, we have just enough time to pick up some licorice filled chocolate from duty free and post this picture from last night. We had a slow start to our last day in Europe. We were exhausted, so when Lila fell asleep in the stroller on the way to the Louvre, we turned around and went back to the hotel for a nap. What a museum! Unbelievable! From the IM Pei's pyramide to the medieval walls of the original building to the elevator that carried us from the entrance to the ground floor. We had just enough time to go through the Sully wing with Greek and Etruscan works. It was particularly interesting to see the Etruscan pottery, jewelry and sarcophagi after so recently visiting their burial mounds in Cerveteri near Bracciano. 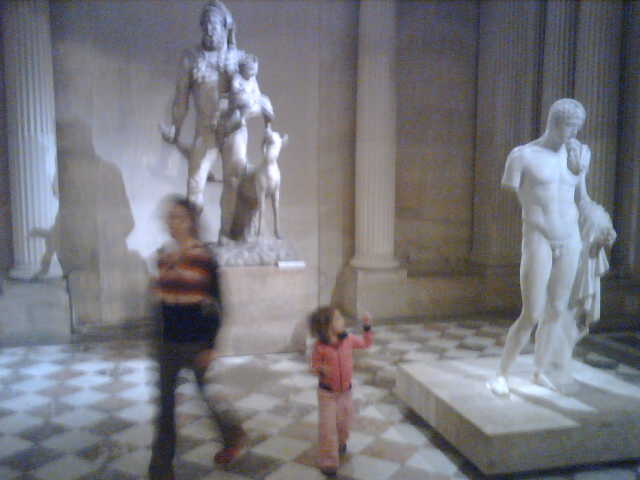 Lila loved the Greek statues. 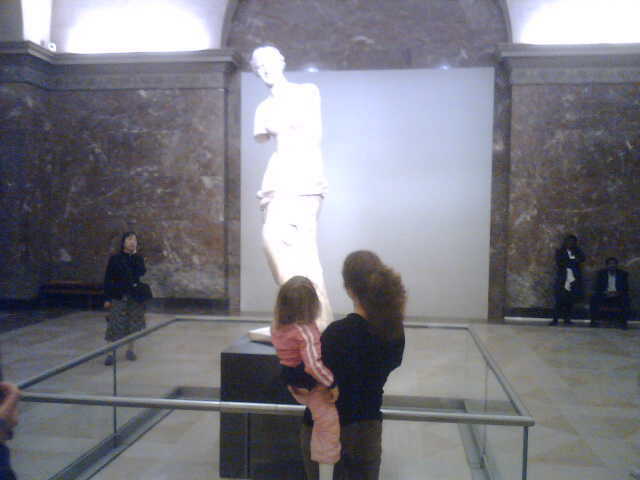 There was a lot of time there spent discussing boobies and tushies, and Lila wanted to know what happened to all the statue's penises. 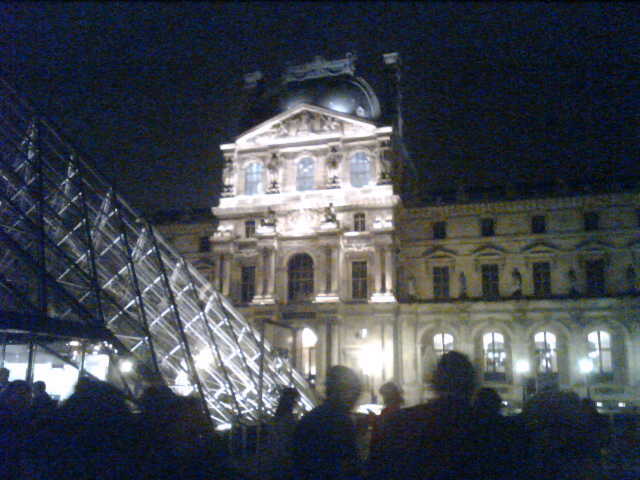 We walked home through the Paris night street. It was cold out. Summer is most definitely over, but it was beautiful. Here we are in Paris. After two long days driving, including getting lost in the maze of Paris streets for a couple of hours, it is good to sit with a coffee and, what else, chocolate ice cream. We used a Pirouline as an applicator for chocolate lipstick. 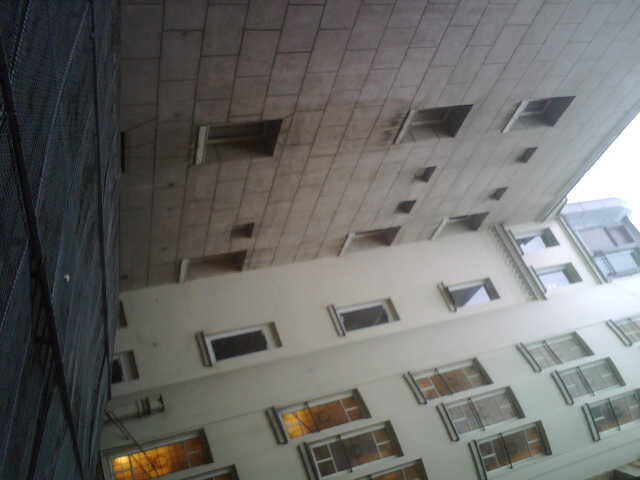 This is the view from our hotel room in Paris. Sorry you have to turn your head to the side to see it. The Blackberry doesn't have a rotate tool for the camera. This airshaft reminds me of my room sophomore year of college. My friend Jen lived across the way. She could see into my room from the kitchen of her apartment. And vice versa, where I saw Rachel making her special pasta and other things. This is where I did yoga this morning. It was cold out, the grass still wet and I could see my breath. The only sounds were those of birds chirping and cows lowing. Noah and Lila are still asleep, and I am alone. Such solitude is rare on a trip like this, and it gives me time to think. Some day, when we settle again, I want to live in a place like this. Where it's quiet. Where people say hello to each other. There's an amazing garden in the back where you'll find tomatoes, asparagus, squash, and more. You can pick apples and Japanese pears, eat them straight from the tree. I would like to live in a place like this where there's a clear water lake nearby for swimming and boating on hot summer days. Where there are traffic free country paths for running in the morning, and I know my neighbors (although neighbor anonymity can also be a blessing). Then my head starts going. For a garden like this, we'd have to live in a temperate climate. Panama has water and warmth, but can apples grow there? I suppose there are plenty of other fruit trees, though. And what about Belgium? 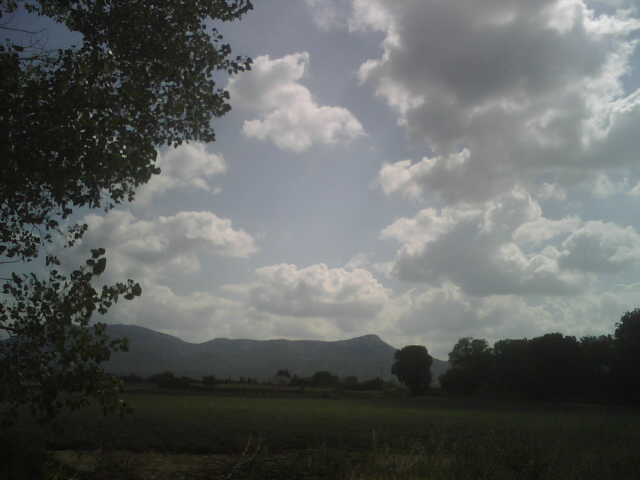 The countryside is gorgeous and the people we met there so mellow and warm. I've been told you can get citizenship after living in the country for only four years. The trick is finding a job first. What would I do? And Belgium is too cold in the winter. I have spun too far ahead of myself. Let me focus on today, the sun, the cows, the cold grass that is quickly warming and drying. 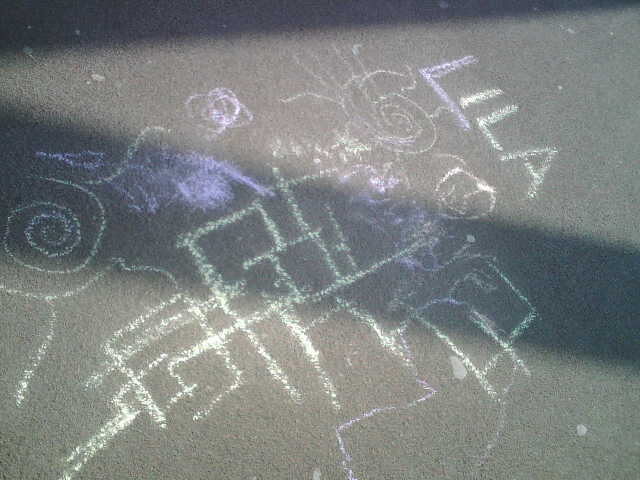 Our chalk drawings from yesterday. We visited the Stedelijk museum today. Unfortunately, the museum building is closed, and they've moved a small part of the collection to a new location. It was disappointing. Not something I've said often on this trip. 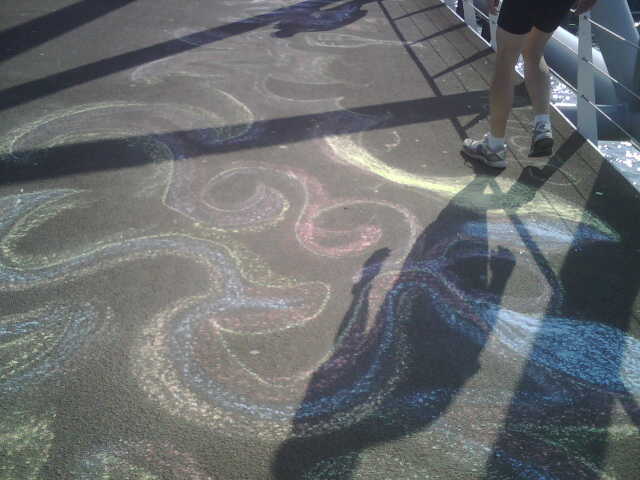 But outside the building, there was a bridge covered with boxes of fat sidewalk chalk, so we drew on the sidewalk with everyone else. Lila made swirls in green, and I used purple. There was a race going on too. We cheered at the starting line with thousands of other people. We walked, shopped, went to coffee shops. I spent some time at a cafe working on the novel while Lila slept in the stroller. Noah drew and people watched. All in all a fun day. 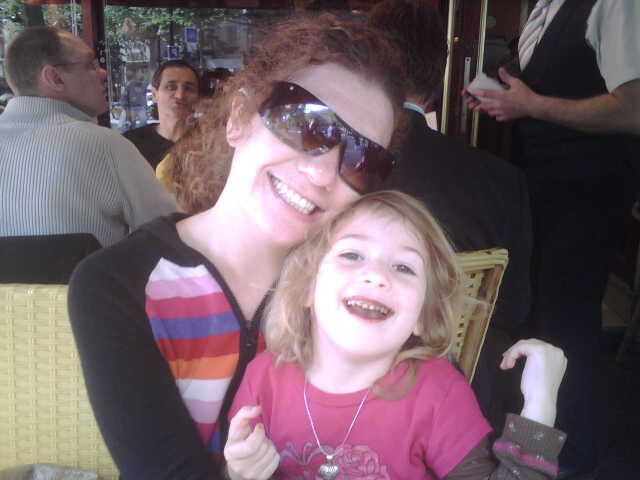 We've been to Amsterdam many times, usually on a stop over to visit family in London. We know the city well, and yet we often find ourselves lost. Still, I am ready to say goodbye to this whacky city to return to peaceful Edam for a good Sunday night sleep. Tomorrow, we drive to Paris. Our flight home leaves Thursday. It seems that something is wrong with my e-mail. I'm not getting many that I know have been sent. So if you've written to me and don't hear back in a week or so, that probably means I didn't get it. And I definitely love hearing from you, so please try resending if you can. You can also try emailing my Yahoo account at leighshulman@yahoo.com. Amsterdam yesterday was perfect. You never know how things will turn out when traveling with a three year old. So usually when we make our plans, we leave room for anything else to happen. But yesterday went as we wanted. I spent the morning shopping with Lila. We found just the right gifts for Karine and Leila. Karine collects rabbits. For her, we got a little bunny necklace and a wooden bunny figurine. We chose owls for Leila. We played hide and seek in the department store while looking for some warmer clothing for Lila. Finally, we went to the Rijksmuseum where we saw the most gorgeous dollhouses with such exquisite details. Oil paintings on the walls, beds with draped silk canopies, a fully set table in the dining room. You had to climb a ladder to see the top levels. Lila was ready for a nap by the end of all that so Noah and I had some time together for a long, quiet lunch, and then it was my turn to have some alone time. We call them "time outs," because everyone needs them sometimes. 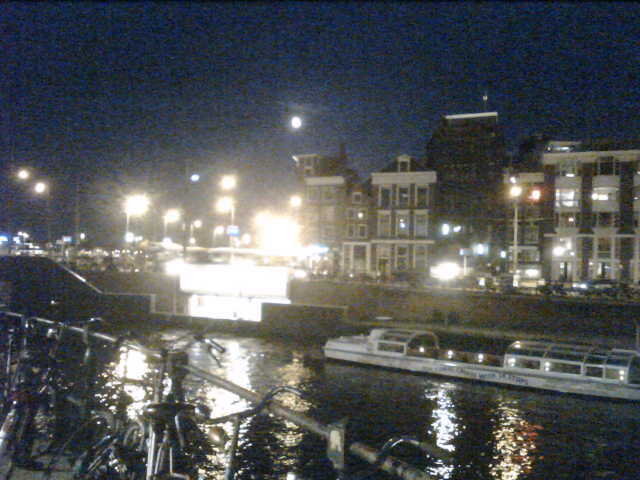 In the evening, we sat by a canal waving at the boats going past before taking the bus back to Edam. The picture above was taken on the walk back from the bus station. Perhaps not the most traditional beginning to Yom Kippur, but it works for us. Today will be a more mellow day, I think, just hanging around Edam and the nearby town Volendam. I'm up early. I'm excited because today we're going into Amsterdam for the day. This was the whole purpose of this trip north, for me anyway. I'm going to see the museums. I've been to them quite a few times already, but never before with Lila. We're also going gift shopping and to look for a new sweater for her. Noah is going to run some of his own errands. I will see Amsterdam today in a way I never have before. Completely clear eyed and with Lila's commentary. Oddly, that is most exciting of all. Today we visited Edam. 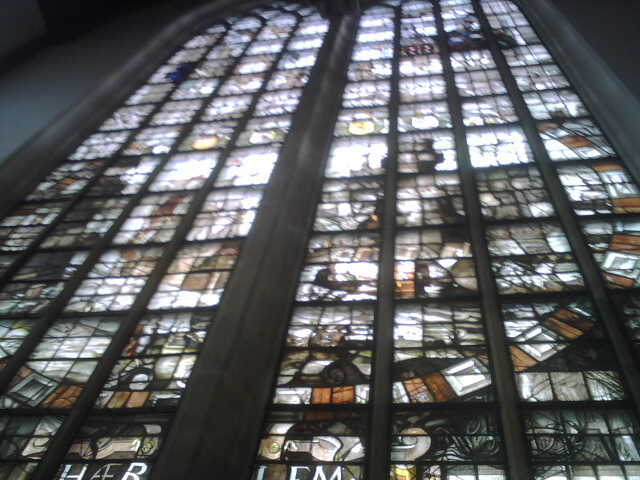 Walked through the town, went to the Grote Kerk. It was interesting to see differences in gravestones in the cemetary behind the church. The older ones were flatter, far less fancy and the graves were closer together. It wasn't sure what to say when Lila wanted to know why people were buried there. I did my best by telling her that when people die, we have to do something with their bodies, and many people like to have their family close to them even after death. Then I reminded her of when we visited Noah's mom at the cemetary in Silver Spring. Who knows what she makes of all this. 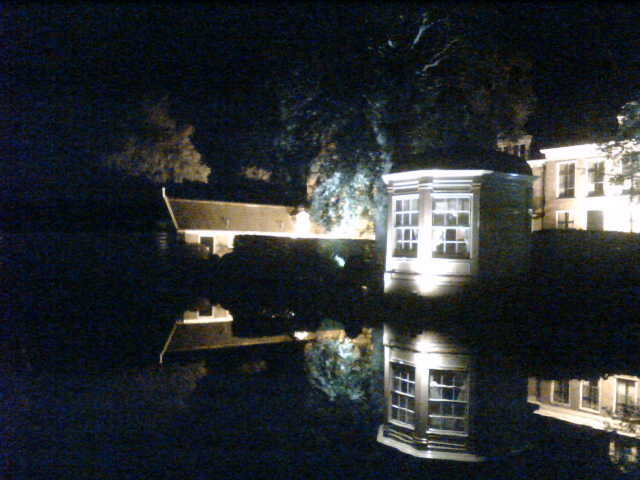 After, we sat by a canal overlooking a field. There were endless shades of green. The deep forest color of the water reflected verdant grass. Maple, oak and linden trees leaves, brown and yellow at the edges, fell to the ground along with seeds and acorns. We sat on a bench watching cows and ducks and just talking. Lila asked me how to say cow in French. "Une vache," I said to her. "How you say me cow in French?" she asked again. Again her same question arrives. "How you say me cow in French?" Once again I reply my same answer. Finally, I realize. She wants me to ask her how to say cow in french. "OK," I tell her. "How do you say cow in french?" "Unnnne vache." she gives with a huge smile. It's hard to believe we've begun the last week of our three months here. Tom, who we couchsurfed with in Brugge, asked if we've changed since we left NY in May. It's hard to know, not yet. But thinking back on the last three months in Europe, I feel like I've done some of the things I wanted to do. I've become fluent in French, improved my chess game, met and spent time with many wonderful, interesting people. Lila has also had a chance to find friendship with others of all ages. . I suppose it's difficult knowing that we may never see any of them again. We might, though. Life is hopefully long, and you never know what can happen. I have to admit, of all the places we've been, this is the first that I am truly sad to leave. 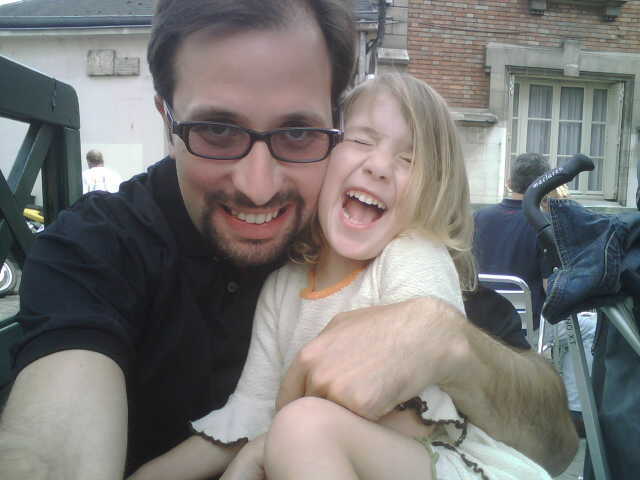 Lila and Noah in Senlis, a beautiful town about an hour north of Paris. We're staying nearby in a small town called Saint Rémy en L'Eau with friends of family. 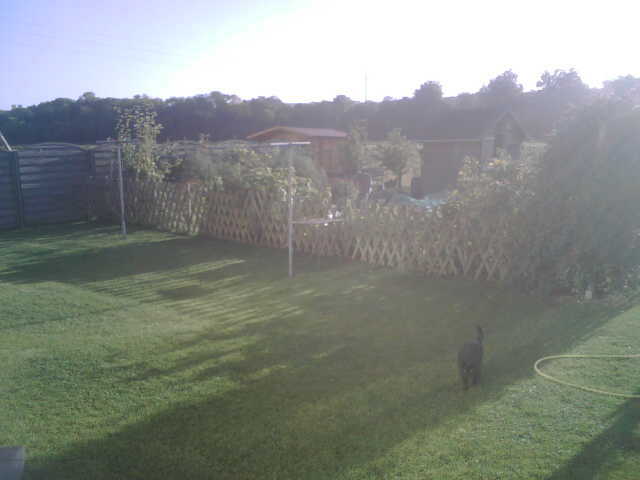 This picture was taken from the back yard of Maryanick's place in Trets. Most definitely one of the top five views of this trip. Hard to believe we've been here two and a half months already. And we've come to know this little corner of France very well. 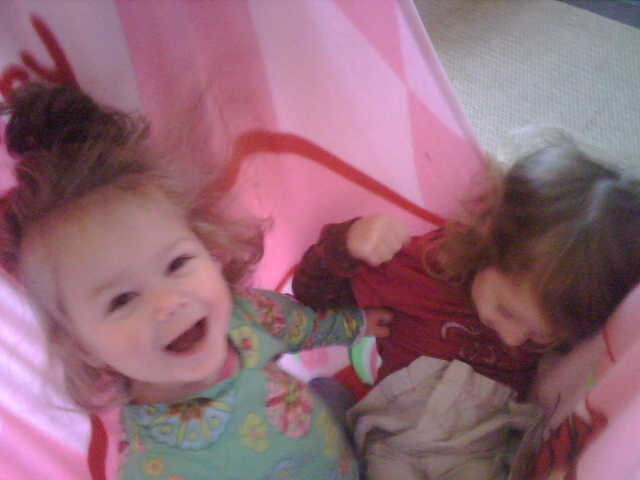 Lila's favorite things were merry-go-rounds, ice cream and the supermarche. Mine: swimming in lakes, beaches and the Etruscan Necropoli. Noah's? Architecture, Roman ruins and wine. The next few weeks are going to be hectic. From Paris we go to Belgium and the Netherlands. We'll be staying with some family friends along the way. When we get back to the United States, the plan is to visit family and friends in Buffalo, Toronto, Montreal, New York, North Carolina and Atlanta. Then Rachel's wedding is in Brooklyn mid-November. We'll be there for a few weeks before. I'm planning a big party for anyone who wants to get together and have a drink. Will post more information then. Then it's on to Panama. Where we will find a place to live, find work and settle in for a few months, maybe catch our breaths.